It’s a plug and play world today, isn’t it? So why can’t your barbeque too be fast and easy? Getting together with friends and building a fire to cook your favorite food sure is a lot of fun, but what if you fancy a grilled meal when it’s raining outside? Indoor grills just won’t do the job any better than your griddle. Getting your favorite grilled goodies quickly is not the only thing that needs the attention. With our outdoors spaces and patios being reduced to shrinking balconies in condos and apartments, there is a need for a simpler, quicker and safer way to enjoy food cooked on a grill. Now this is exactly why we have products like the Char-Broil TRU-Infrared Patio Bistro in the market. Coming from the house of Char-broil, a name that is synonymous with outdoor grills and smokers, is this Bistro grill that uses the latest Infra red technology to give you a faster, hassle-free grilling experience. 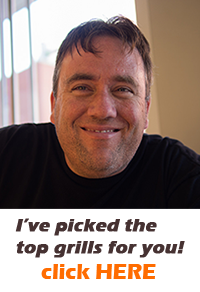 You will find a lot of char-broil reviews that speak mostly about the features of the grill instead of giving you a real review based on customer experience. Here we strive to give you a well-researched and an honest review to help you decide if this grill is the right one for you. 1 Infra red – How does it work? Infra red – How does it work? Infra red rays, just like your microwaves, belong to the electromagnetic energy spectrum. Every type of cooking that produces heat releases a certain amount of infra red radiation. But they account to a very less percentage of the heat produced. They can heat up the food without coming in direct contact with them. An infra red grill can heat up faster and reach much higher temperatures compared to a regular electric grill. The Char-broil heats up an Infra red element which in turn provides quick and even heating of the cooking grate on which the food sits. So is the Char-broil TRU Infra red for you? Read on to find out! Get an in-depth analysis of the Char-broil infra red electric grill as we tease out its features below. The metal grate of the grilling area is a double-decker style with a primary grilling area of 240 square inches. There is a warming rack that sits on the rear of the grill thereby increasing the total grilling area to 320 square inches. It can easily handle a dozen burgers at one go. The warming rack is ideal for grilling vegetables which don’t require higher temperatures like meat. With electric grills, you don’t have to worry about using fire to cook the food or deal with messy charcoal briquettes. It also cuts down the fuel refilling step that is required for gas grills like propane grills. Gas grills and charcoal grills pose a fire hazard and cannot be used in smaller living spaces like condos and apartments. Electric grills as this one are ideal for places with a small foot print. The cooking grate is also specially designed with a triangular shape to avoid possible flare-ups. The grill comes with a cool handle for the lid. Once you’re done with the cooking, you can immediately stow away the grill as the grate cools down pretty quickly when unplugged. The grill uses a combination of convection and Infra red radiation to achieve very high temperatures that is not possible with an electric grill and at a much faster rate. So you can sear all your favorite food and get them to the table in no time. The infra red system helps transfer the heat evenly to the cooking grate and so your food gets cooked evenly without the problem of cold or hot spots. Convection heat uses the air around the food to circulate heat and can dry up the food very easily. Unlike convection heat, the infra red radiation heats up the food directly without drying and so you get grilled food that is juicier and tastier. You can easily control the temperature of the grill with a precision dial and maintain it once the required temperature is achieved. In case you are not sure, it comes with a thermometer on top of the hood. At the core of the grill is a 1750 heating element that heats up the Infra red system to achieve even and fast heating of the food. The grill can be plugged into a regular 120 volt outlet just like your other kitchen appliances. Moving your grill is as easy as using your stroller bag as it mimics the same design. With two wheels at the back, you can simply lift the front and roll it wherever you want. There is no need to unnecessary lug a 50 pound appliance. Steel grates can be tougher to clean than cast iron, but this grill comes with a steel grate that is porcelain coated for easy cleaning and to keep them rust-free. The electric grill will take up only a very small portion of your balcony as it measures only 38.2 x 25.2 x 24.4 inches. For a small foot print such as this one, it offers a great grilling area and so will be loved by those who have a limited outdoor space, but want to enjoy grilled food. Grills are prone to quite a bit of wear and tear as they are used outdoors. Even though the Char-Broil is not a full-blown outdoor model, it can easily be used in your backyard or patio too. And the fact that it’s portable only adds to the wear and tear quotient. But the body of the grill is made of powder coated steel to prevent rust and gives it a stylish, glossy finish. The Char-broil electric grill is a light weight design weighing only 54 pounds. The sleek design however does not compromise on the grilling capacity and in fact has a larger grilling area than most electric grills in its segment. You can’t complain if this grill does not offer you the features of a full-fledged barbeque grill, but we did a bit of research to see if the product performs as promised. The lightweight construction was probably aimed to make it easily movable, but the stability factor has been overlooked in the bargain making it very flimsy to use. Under the grill is a tool rack meant for placing your grilling tools, but neither is it sturdy enough or easy to use due to the placement. You are better off with a side table to place your tools. It’s a given that most grills take time to assemble, and this char-broil grill is no different. The assembly takes a good amount of time and effort for a patio model. To make things worse it suffers from poor designing wherein the holes for fixing the parts together don’t align together easily. This is especially true with the warming rack on top of grill. Some customers have experienced a drop in temperature when the lid is opened frequently or if it is left open. Some others also feel that it does not reach very high temperatures that an Infrared grill should ideally achieve. The unanimous verdict is that it can reach 500 on the Fahrenheit scale but not any higher without spending a lot of time. The outside temperature can definitely play a role in maintaining the temperature; so this needs to be factored in before buying this or any other grill. The power cord is incredibly short measuring about five feet. This means you can only use it very close to your power source. This will really be a problem if your balcony does not have a power point. Using extension cords are not advisable as they can cause electric short circuiting and run the risk of a fire hazard too. Though the char-broil electric grill can sear meat and other foods, it cannot be compared to the searing that is possible with charcoal and gas grills. But this is only a minor disadvantage that gets overlooked due to the many positive aspects of the grill. In fact, it makes up for it by giving you food that is juicier than what you would get on a gas or charcoal grill. Those who are used to the gas and charcoal grills might feel that food cooked in an electric grill does not have the same smoky flavor! An easy way to achieve this would be to use wood chips on the edges of the cooking grate. If you don’t want them on the grate where the food is cooked, you can simply wrap them in foil sheets with holes punched and toss them under the grate. This produces the same smoky effect but may not really satisfy someone whose taste buds are too accustomed to the original flavor. Even though the grate is designed to be easy to clean, with porcelain coating and a triangular shaped grate, user reviews suggest otherwise. The best way to care would be to clean the grate and the heating element after every use. This will avoid build up of grease and other food debris. For the heating element, turn it on to loosen or melt the debris to make it easier to clean. Though the grill does not employ fire to cook, the heating element can cause flare-ups upon contact with grease and can pose a fire hazard if used indoors. Electric grills, per se, are increasingly becoming popular when compared to gas fueled or charcoal grills due to their ease of use. But how does the Char-broil fare against its competitors? 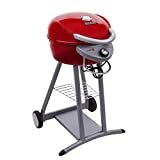 Other electric grills that compete with the Char-broil Infra red are the George Foreman GGR50B and the Meco Aussie 9329W. The Char-broil emerges as the clear winner when it comes to maximum grilling area with an impressive 320 square inches. It can handle a lot of food at one go and would be a great investment if you have frequent get-togethers at home. You can even have tailgate parties with this easily portable and light weight electric grill. But finding an electric outlet may not be that easy. The George Foreman comes next with 240 square inches of grilling area and the Meco is the smallest with 200 square inches. The Meco Aussie is pretty expensive at $340 while the Char-broil packs in a lot of features at a price tag that’s under $200. It offers great value for money especially to those who live in apartments, condos and areas that restrict the use of fire. Char-broil is one of the oldest makers of grills and smokers. The craftsmanship of the Char-broil speaks for itself as it comes with a maximum warranty of 2 years when its contenders both come only with a one year warranty. 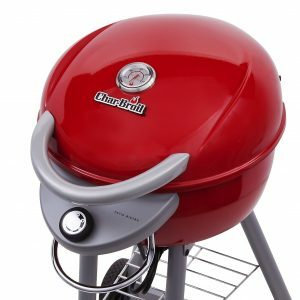 The grill is surely an urban favorite with its sleek design and is available in an impressive selection of seven colors, while its rivals score nowhere closer. Urban living and tighter spaces have paved way for newer technologies and products to help us enjoy an outdoor cooking experience. To meet the demands of today’s busy and modern lifestyle, these products suffer from the pressure to be aesthetically appealing and easy to use. In the bargain, they tend to lose out slightly on the function aspect. But rapid advancements in technologies are fast bridging this gap. You don’t have to believe everything we say but read other char-broil reviews too to get a better idea of the product. It is also clear from customer reviews that it has both satisfied as well as dissatisfied users, which means it might work for you depending on what you expect from a grill as this one. All in all, it is a good looking balcony or patio grill with great features for the price you pay.